Using the power of words, we put Nationwide and Shelter at the heart of the conversation around the UK's housing crisis. There’s been much conversation around the economic effects of the UK housing crisis, but its time we talk about its social impacts on the younger generation. An open house is when prospective buyers view a home, but it also represents a place where guests are welcome and heard— like an open mic poetry event. The Open House Project, sponsored by Nationwide and Shelter, provides a poetic portrait of every person dealing with the housing crisis. Through a stunt and Instagram campaign, the comfort of words give people a safe space to have their voices heard. Post an Open House ad on popular flat hunting websites. It is later revealed that the event is actually an Open Mic Poetry event. Poets meet with the attendees and use their stories as inspiration for the Instagram poem campaign. 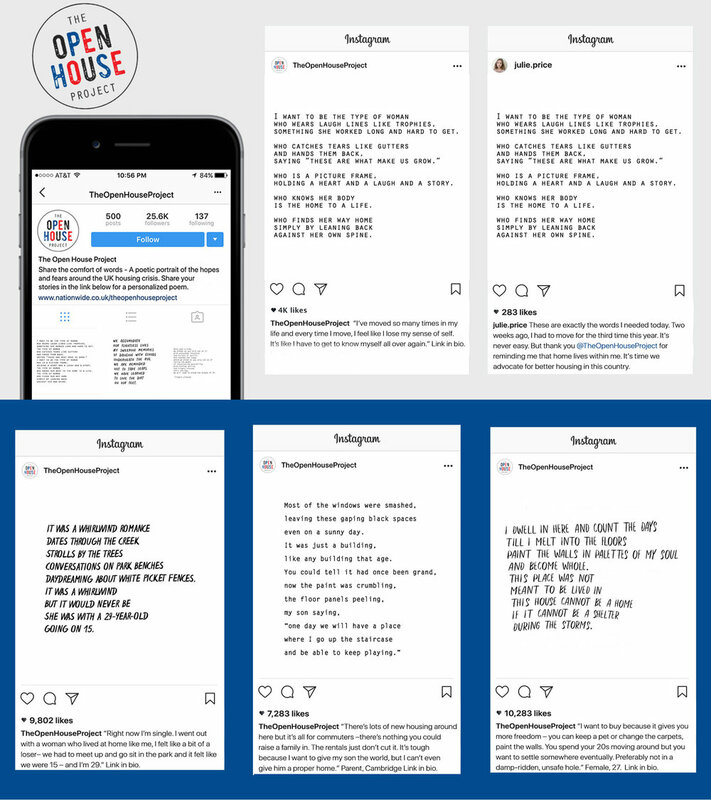 The Open House Project invites people to submit their stories and have a poem dedicated to them. Murals around the city invite people to share the comfort of words.